This information serves as an appendix to my article “Explaining the Amygdala Retraining Program™ for ME/CFS/FM and Associated Illnesses.” It covers the range of physical symptoms as well as cognitive and emotional symptoms that those with ME/CFS, fibromyalgia, and associated illnesses may experience – explaining how they may be products of amygdala hyper-sensitization. As a preface to all this, I do believe that these symptoms are temporary. That is, they are due to systemic functional changes in the body, rather than permanent organic damage. Stopping the amygdala’s hyper-reactions allows the body to trigger the parasympathetic system, meaning the body’s own healing mechanisms can bring it back to balance and homeostasis. The stress response is sometime known as the “fight, flight or freeze” response. These responses, including excessive adrenaline, keep the muscles tense, and are only designed to be triggered for minutes at a time. Relaxed muscles are in a state called tone, which is a state balanced between relaxation and contraction. Prolonged tension in muscles upsets tone and allows the chemicals of fatigue (e.g., lactic acid) to temporarily accumulate and disperse, causing aches and pain. Prolonged tension is initiated and maintained by the stress response, as the muscles are primed for reaction to dangerous stimuli. This is why you may suffer from aching limbs that seem to feel heavy and drag, but there may be nothing actually physically wrong with the muscles. A few patients have found that magnesium supplements tend to help muscle tension. This is because magnesium acts as a muscle relaxant, and can be found in green leafy vegetables as well. Several studies have shown that insomniacs cannot get to sleep mainly because they are worrying about something, even if they are very tired. Studies also show that the amygdala is partly responsible for keeping people awake at night due to unconscious stress. ME/CFS/FMS patients have the same problem: Their minds are constantly being bombarded by thoughts telling them that there is an ever present danger that is unresolved, and so they find it difficult to get to or stay asleep. When a mind and body is tense, sleep is interrupted and fragmented during the night. Studies have shown that interrupted sleep causes further aches and fatigue the next day. Overall, a prolonged stress response causing an interrupted sleep has adverse reactions on the body clock, and indeed some studies have shown a mismatch between temperature rhythms and melatonin secretion in patients. The mismatches in patients have been shown to be very similar to those suffering from stress and sleep deprivation, as well as PTSD. Furthermore, it is the hypothalamus that regulates sleep rhythms, and it is precisely this brain structure which is being bombarded by signals from the amygdala. Some studies have also shown that patients do not respond correctly to exercise, in terms of inadequate release of a stress hormone called cortisol. This is because the severe stress response means that the stress glands may eventually get depleted (e.g., adrenal exhaustion), or they downgrade and adapt to chronic stress, and while the signals still exist to release cortisol, the response no longer occurs. Furthermore, the system may have cut back on supplying cortisol, because it has been over-stimulated in the past. Because muscles are already exhausted from being tensed up all day, they also find it difficult to respond to exercise. There may also be a whole host of hormonal changes in the body which mean that the body cannot respond effectively to physical, mental or emotional stresses. If the brain and body has been stimulated continually, it cannot perform appropriately because as far as it is concerned, it already has “been performing” for long periods of time, and exhaustion easily sets in. The digestive system has its own nervous system, sometimes called the “small brain.” It becomes stimulated by the brain via the autonomic nervous system during stress, and this causes problems in the gut, and may tense muscles and generally over-stimulate the gut. Also, when the “fight or flight” response is initiated by the sympathetic nervous system, adrenaline and noradrenaline direct the bodily energies and resources to the organs which are involved in fighting or fleeing. These are the muscles, so that they can respond quickly, and the brain, so that the mind can think quickly and concentrate on the source of the danger. Therefore, all other non-essential bodily functions are switched off, such as the digestive system. This means that food regularly passes through the gut but is not digested correctly, giving the symptoms of IBS. Furthermore, all muscles in the body are tensed, potentially including the muscles within the small and large intestines. The colon normally moves food by moderate contractions or spasms. Muscle tension upsets these rhythms, giving either too many or too few contractions, leading to either diarrhea or constipation, or both. The gut can become highly sensitized to toxic elements in the diet, or at least foods which may now be perceived as toxic. The body is now in a very sensitized state, and therefore will over-protect itself to survive. Oxidative stress may cause “gut leakage,” triggering sensitivity reactions. Some patients find that changing their diet seems to help, and that is because there are certain food types which are easier to digest. Eating foods which are difficult to digest while the digestive system is in this state theoretically could worsen symptoms. The immune system is always in a state of delicate balance, ready to respond appropriately to a threat. However, if the perception of that threat is overstated, there may be some aspects of a reactivated immune response that is constantly on alert. I will not go into the neurobiology of this mechanism here (it is commented upon in the medical paper). Suffice to say that, given that the original trauma often occurs in the presence of a severe virus/bacterial infection, it is no mystery that the body will retrigger immune defenses as a way of making sure the body survives, even if no viral threat exists. This can often feel like having flu or a slight fever, as well as swollen glands and a sore throat, and may be the effects of chemicals called cytokines. In some patients, this may result in a susceptibility to viral infections, and many of my patients report this. Others, however, may find that they do not have any more viruses than normal. If the immune system is inappropriately retriggered, latent opportunistic viruses can take hold. Furthermore, triggering of the stress system is known to reduce the effectiveness of the immune system, thereby allowing opportunistic viruses to flourish, causing further symptoms. Recently, Professor Garth Nicolson showed that there were similar levels of multiple, systemic bacterial and viral infections in ME/CFS patients as there were in people with autism. Autism is a disorder where sustained amygdala hyperarousal is accepted as a model for partly explaining the disorder. The delicate muscles which accommodate the lens of the eye are also affected by muscular fatigue, so that vision may be blurred, especially when looking near-to-far and vice versa. Eye fatigue also occurs because, when the fight or flight system is initiated, the vision sharpens and the eyelids retract so that the eyes can focus better on the source of the danger. 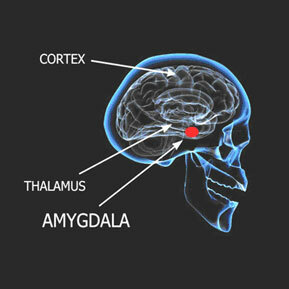 The amygdala sends direct signals to the autonomic nervous system, which co-ordinates many bodily responses including temperature and blood pressure. Therefore, abnormalities in autonomic function can be directly attributable to chronic stimulation by the amygdala. Anxiety is well known to cause sweating, and even temperature changes. Some patients may become “orthostatically intolerant”, e.g., they have low blood pressure when they stand up, as tested by the tilt table test. This may be because of excessive pooling of blood in the legs, as the autonomic nervous system constricts blood vessels in the body, except in the limbs, so that a person can run away from dangers. This may cause problems when standing up, like dizziness, as well as reduced blood flow to the head. The limbic system of the brain (which houses the amygdala and the hypothalamus) has been implicated in allergic responses and sensitivity responses. These systems become “over-cautious,” reacting to toxins and pathogens “just in case” they represent dangers. When the amygdala is on high alert, it is prone to learning new sensitivities and threats which ordinarily would not have been reacted to. When the body is in this sympathetic stress mode, non-essential systems are switched off, including aspects of the body’s detoxification and elimination processes, and healing and repair systems. Therefore, if this reaction is prolonged, there may be accumulation of toxins in the body. Many patients complain of “feeling toxic.” If the amygdala is retrained, the parasympathetic system can gradually detoxify the body in the correct way. Intolerance to alcohol has often been cited as a characteristic marker of ME/CFS/FM. Much medical research demonstrates that alcohol actually induces the stress response by stimulating hormone release via the hypothalamus. This is exactly the response which the amygdala is conditioned to respond to, causing further symptoms. Furthermore, this reaction may malfunction due to a downgraded HPA axis and other hormonal abnormalities as a result of the stress response, causing increased sensitivity to alcohol. The autonomic nervous system affects all the organs and systems in the body, and that is why so many wide-ranging symptoms are experienced. And because the amygdala is at a heightened state of awareness of all the messages coming from the body, new fears can be “learned.” This means that even when innocuous signals come into the sensory neurons, these signals can be misinterpreted as dangerous by the amygdala. This happens because some patients can tend to monitor signals from their bodies, and signals can be perpetuated. This explains why patients can develop added symptoms, which can mysteriously come and go. Once again, these occur as a result of prolonged muscle tension in the head. The mind is particularly in a state of heightened arousal throughout the day, and becomes stressed and exhausted from so much stimulation. This can make the head sensitive and sore. Because there may be reduced blood pressure and blood flow to the head, this contributes to brain fog because there simply are not enough resources being channelled to the brain. The mind is on edge due to the excited state of the amygdala. Furthermore, the conscious mind is “arrested” by the amygdala, as it gets bombarded with signals about the body. Therefore, the mind finds it difficult to focus on other tasks, because it is also trying to process the signals about the body. When patients are in the state of heightened arousal about symptoms, their memory systems are reshuffled so that knowledge and memories most relevant to the symptoms will be recalled, taking precedence over other less relevant strands of thought. This makes concentrating on anything else very difficult. An area of the brain called the hippocampus has a dual role; firstly in providing short term memory retrieval, and secondly as a “control knob” which tries to moderate the release of the stress hormones. The hippocampus becomes damaged during a chronic stress response, and no longer is able to fulfil these dual roles well. Therefore, the formation of new memories in the hippocampus is inhibited, which means that you may have problems with short term memory formation and retrieval. Whilst this effect may seem frightening, recovery will mean that the hippocampus can return to its normal functioning. The stress hormones and neurotransmitters are known to increase emotional lability and feelings of vulnerability. This causes a wide variety of added psychiatric complaints and further learned fears, especially depression and sometimes agoraphobia. Your amygdala is deliberately trying to make you feel anxious, as it is trying to warn you of danger. The long term arousal of the amygdala means that stress hormone release can become poorly controlled. Therefore, external events which have little to do with bodily symptoms make you feel far more stressed than normal. You may perceive the world as more dangerous than it actually is, and this is made worse by the fear of increased symptoms because of stress. Many patients become prone to panic attacks, which are known to be mediated by the amygdala. Prolonged worry may mean that the amygdala becomes trigger happy, triggering at the slightest negative signal from the body. It may detect certain bodily changes such as blood pressure increasing as a result of an external event, it prepares for a panic attack, and hence this becomes a self-fulfilling prophecy: The amygdala and the conscious mind fear a panic attack coming on, and this in itself initiates it. In general, if you experience increased external stress, this makes the symptoms even worse. This is because the stressful events impact on an already fatigued and sensitized mind and body. In some patients, changes may occur in the brain’s opioid system. This system becomes hyperactive. This gives the feeling of numbness, and other psychological symptoms including “anhedonia” (the inability to feel pleasure), and a sense of being cut off from life. I do believe that these symptoms are temporary – that they are due to systemic functional changes in the body, rather than permanent organic damage. Stopping the amygdala’s hyper-reactions allows the body to trigger the parasympathetic system, meaning the body’s own healing mechanisms can bring it back to balance and homeostasis. The Amygdala Retraining techniques explained in the accompanying article “Explaining the Amygdala Retraining Program™ for ME/CFS/FM and Associated Illnesses” and taught in my clinic* are now available as a home study interactive DVD Recovery Programme, which includes DVDs, a CD, and a book, as well as access to a recovery forum and further support. The programme comes with a one-year money back guarantee. For further details, visit www.guptaprogram.com. * Ashok Gupta’s Amygdala Retraining ”Clinic – Harley Street Solutions, LTD – is located at No.1 Harley Street, London W1G 9QD. To contact the clinic, e-mail info@guptaprogramme.com, or visit the website at www.guptaprogram.com*. Note: This information has not been evaluated by the FDA. It is for general information only, and is not meant to diagnose, prevent, treat or cure any illness, condition, or disease. It is very important that you make no change in your healthcare plan or health support regimen without researching and discussing it in collaboration with your professional healthcare team. *As of January 25, 2010, Planet Thrive is participating in an affiliate program for the Gupta Amygdala Retraining Programme™ after observing over 30 members of the Planet Thrive Gupta Support Group, who reported many benefits over several months time.